As a University student and a very organised person, I wanted to share my tips and tricks with you today on using your planner productively. This may be as a student, for work or for general use in life or as a blogger. I have three planners, one is for general life and my job, the second is for university and my studies and the third tiny little one is for my blog. I like to know what's going on and when and planners are the best thing for this. I have also colour co-ordinated each of my planners. Within my general life one, I have to match up when my half terms are as a student and in my job, so I colour co-ordinate this so I know which is which. As part of my blog, I write about various topics, I think 5 in total, and 6 if there's a special season. Therefore, right now it is now officially Autumn so there will be many Autumn based posts. Being able to colour co-ordinate these to my scheduled/planned posts, I can see exactly how many posts on each topic I have scheduled throughout each month. It tells me what I'm lacking in. So this is my university planner, as you can tell, my planner is very very empty right now! I go back to University tomorrow so all I have really wrote in this so far is the teaching weeks, and dates of half terms etc. However, within my university planner I pretty much write down absolutely everything, any "homework" which they set us to complete ready for our next lecture, any submission dates, deadlines, days where I'm going to dedicate all of my time to completing something. I write down absolutely everything so I know exactly what is happening in my life. This is my personal planner for my everyday life, a place where I write down what hours I'm doing at work, what hours my boyfriend is doing at work and what I'm doing on a day-to-day basis. If I have plans with my boyfriend, I'll write these down. Writing everything down in my life makes me feel like I have my life together when to be honest, I probably really don't. I haven't had my tiny bloggers planner for very long to be quite honest, however I already feel like it has made a difference to my blog already. I decided to colour co-ordinate my topics which I feature throughout my blog. From this, I could then colour co-ordinate my overall monthly view and see what topics are featuring more than others. I am also able to see what days I'm not scheduling a post for so if I have worked with any brands etc, I can quickly throw in a post into that space. When I write each post into my diary, I also use the same colour pen which I have colour coded it too. It just makes my life so much easier and I know I have my life together, as well as my blog! Honestly I couldn't stress this enough! 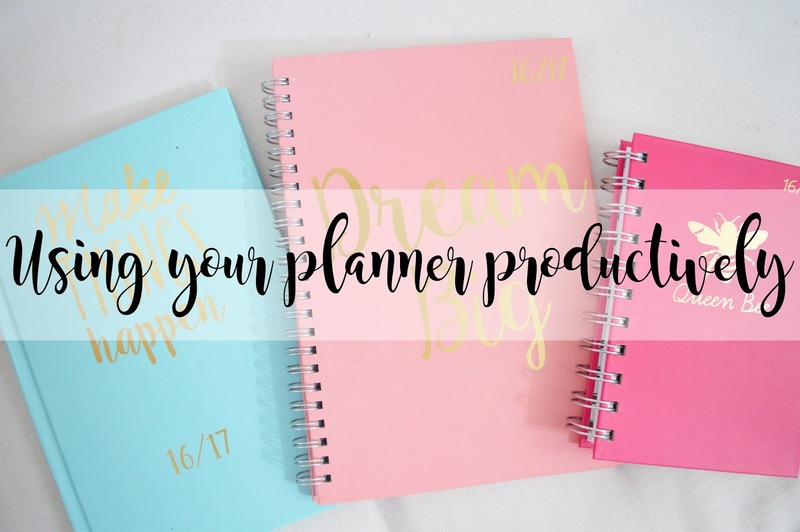 There are so so many planners out there in so many different sizes, and it can be quite nerve wracking trying to decide which one would be best for you! Where would you be using this planner? Would you be taking it in your bag? How big is your bag? Do you want a light weight one if you're travelling with it? You need to ask yourself so many questions when finding the right planner for you, but you'll know it's the right one when you see it. Another important step! To be a fully organised blogger/student or just a normal person (obviously everyone is normal) you are going to need to colour code if you are using one planner for absolutely everything. Colour coding makes life so much easier because it's the colours which make it a lot more visual when reading something and trying to remember it! It also makes your planner so much more fun which leads me onto my next step. I absolutely love my planners because they are bright and vibrant and colours I love! If you are going to be using your planner day in day out to organise your life, you are going to want to be writing in something which is fun and you're not going to get bored of. You can add so many different accessories to your planner to make it fun as there are so many arts and crafts bits on the market! I know many people go for a plain boring black planner which just makes life even more dull than what it already is. Go for the bright planners and you'll enjoy using it! Don't plan too muchThis is definitely one of my weaknesses and I will also be the one person who writes a full A4 page of things "to do" in one day and obviously one day will never be long enough. Don't plan too much and be realistic on how much you can actually get completed and also cope with! You don't want to end up stressing yourself out and then feel disheartened when you haven't completed anything. Last but not least, if you think of something, write it down! This is something that I definitely fail at sometimes, and then I end up forgetting something really important. If you carry your planner around every where you go, then you will definitely not have this problem! Also, writing on your hands is not good for you, I'm sure you learnt this when you were in school! Let me know if you use your planner productively, and what for! Great tips, you seem very organised! I like the idea of planning out blog post topics :) Where did you get your planners from? They are so cute! Great post! I love my planner because it helps me, along with my digital calendar, to keep track of my forever changing schedule! I love this! I have so many planners but they always get so messy and unorganised haha great tips! I love a good planner! These are great tips, especially color coding. It helps so much in keeping everything organized.